If you start and end your fall with watching Charlie Brown and the Great Pumpkin, then this figurine is for you. This adorable figurine features Linus and his blanket and shadow of Snoopy in the background. This figurine also lights up for an adorable display. Pumpkins are part of any fall décor, and if you like to keep yours on the spooky side, consider adding this figurine to the mix. 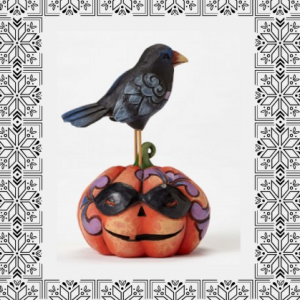 This whimsical masked pumpkin has a crow standing on top of it for a folksy accent. This figurine would look great with other pumpkins or around twinkling lights. Do you like to transition your fall decorations seamlessly with your winter decorations? Well, if you like Disney, you can do just that with this Sally figurine. This Nightmare Before Christmas heroine is beautifully carved and painted to stand out among your decorations. Can’t wait to start adding to your fall décor? Visit us at CoppinsGifts.com for these and other fall Jim Shore figurines. Check out a variety of witches, black cats, and more with this cool collection of figurines. Shop now and get ready for fall!